Whether you need help getting started with hen keeping or are already up and running I'm sure we can help you. We offer a variety of services and products from complete Eglu Starter Kits to Hen Supply, Eglu/Hen Boarding and Deep Cleaning. We've listed everything below, but if there's something you can't find or are not sure about please don't hesitate to contact us and ask. If you do not want to purchase the complete kit we will also supply the above items individually at the same costs shown above. But remember if you order all at the same time you can save loads of money by avoiding additional delivery costs. Assembly of the Eglu Cube will take around 3 hours - we can do this for you at an additional charge of £50**. Our flexi netting is just the ticket for keeping your hens confined to a section of your garden... and keeping them away from your tasty vegetable plot! It's available in 12mtr, 21mtr and 42mtr lengths with a proper gate opening and extra height to ensure even the flightiest of birds behave. Stocked here on site, ready for you to take away. We will source, collect and deliver your hens straight to your door	- you tell us what colour, size, type, what colour egg shell you would like and we'll make every effort to source them for you. The price of hens does vary depending the breed and their availablity. 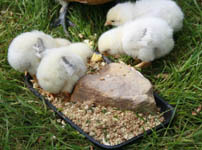 We can supply 20kg sacks of quality layer pellets, oystershell grit, and as a treat for your hens tasty dried mealworms - these are the perfect taming aid and your hens will love them! To help keep your hens in the peak of health we can supply you with our Health Box which includes Pet Safe disinfectant spray, Verm-X wormer pellets, large Diatom puffer antiparasite powder (450g), and "True Blue" anti-bacterial, machine washable rubber gloves, (These gloves ARE "the business"! ), all packaged in a neat plastic basket with clear explanation of use. If you have wooden hen housing then we stock every item of armoury to stop these bloodsuckers from draining your hens as they roost at night! The latest FogFumers smoke bombs to clear an infested house, Total Mite-Kill lasting spray for perches and crevices, Red Mite Blitz Kits, Diatom Powder residual mite control, Barrier Red Mite powder/conc spray for protecting your birds. We have the spray that will zap this painful development. We stock all these items here along with with many other hen keeping products, so why not check with us first before buying online and having to pay extra carriage charges. If you're going away on holiday, why not let your hens have a holiday of their own? You can deliver your hens to us and we'll board them in one of our Eglus, or if you have an Eglu of your own you can bring it and your hens to us and we'll look after them while you're away. Your hens and their Eglu/EgluCube will need a good deep clean every now and then - this keeps them happy and healthy in their homes. With a professional knapsack sprayer we can clean every crevice! This is ideal if you're too busy or just don't fancy undertaking the task yourself. If your hens are not as happy as usual, you can call us out and we'll give them an initial health check and can also carry out some remedial actions such as worming, de-lousing etc. You may wish to “Grow Your Own” and your broody provides the perfect opportunity! Set her up with fertile eggs and three weeks later…. chicks cheeping! We supply fertile Hatching eggs with a wide choice from our purebreed flocks running with their cockerels. It is a really educational experience and great to watch the mother hen with her cute wee chicks. There will of course be boys as well as girls, but there are options here and we can advise. You can never hatch too many girls! All good things come to an end and your hens are no exception, our "Curtains" service will humanely dispatch your hens for you. And of course, we'd be happy to supply you with your new stock! The above prices include us travelling within a 10 mile radius of Dron Court, locations outside 10 miles may incur an additional travelling cost. We will always advise you of this prior to our visit.